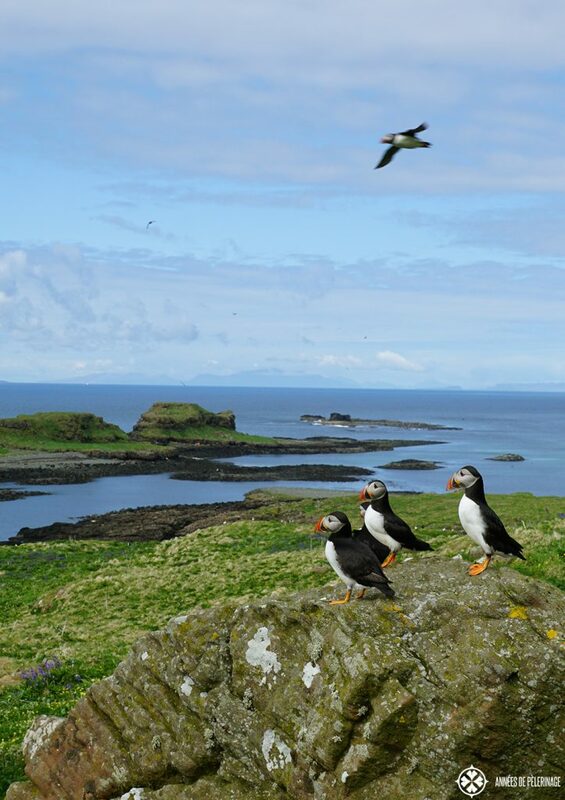 The best place to see Puffins in Scotland. Lunga is verdant for outstanding wildlife experiences. There are few places left on earth, where you can experience unspoiled nature and abundant wildlife. Lunga on the Treshnish Isles in Scotland is one of those rare places. I will admit that Scotland isn’t readily associated with wildlife experiences. Yet, there is more to the country of Alba than rolling green hills, high cliffs, whiskey and quite a bit of rain. 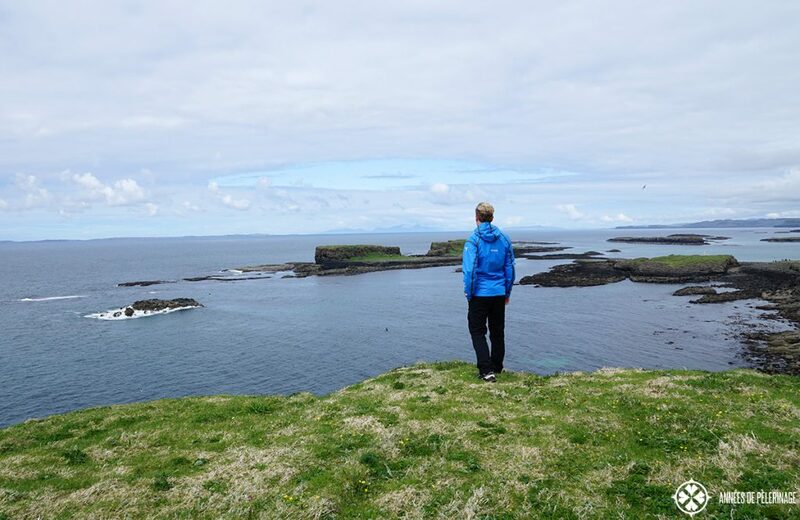 When planning my trip to Scotland (read my itinerary here) I stumbled over the island of Staffa. An amazing volcanic island, so surreal it looks like alien shaped it thousands of years ago. I just had to see it! Quite accidentally the tour I decided to take had a stop on Lunga, some 10ish kilometers farther north. I am quite ashamed to admit (being the control freak I am) that I was thus utterly unprepared for the spectacular wildlife waiting for me on this unique island. It was…. crazy…beyond overwhelming, and I don’t say this lightly (check out the otherworldly wildlife experiences I had on the Galapagos Islands to get an idea). 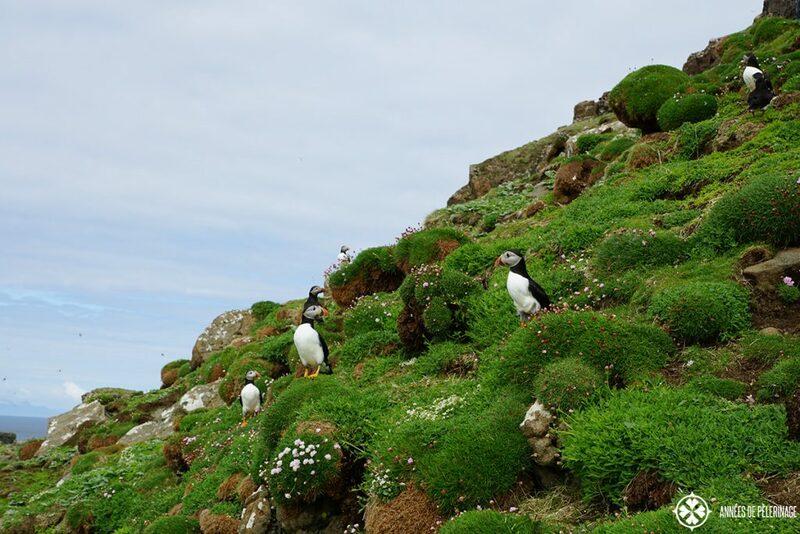 Puffins, Seals, Guillemots, Razorbills – there was barely a single empty nesting spot among the high cliffs of the tiny islands. And believe it or not, none of them in the least shy. I was able to get as close as 1 meter or less. We only had two precious hours on the island before the boat departed again. Luckily the sun was shining oh so prettily, bathing the island in a luminescent green. There was a little path winding up the high cliffs. I didn’t know what was expecting me, as I already detailed out. I thought we’d see a couple of Puffins and that’s it. Since the landscape of Lunga was already presenting itself in picture-perfect greens, disappointment was out of the question anyway. But as soon as I climbed the cliff, I entered a moss-covered plateau and things got out of hand. Hugging the cliffs where thousands (quite literally!!) of Puffins, standing over their freshly dug burrows. Being the wildlife fan I am, I almost suffered a heart attack. And another one when I cursed myself for not bringing a proper telephoto lens. But much to my amazement, the Puffins didn’t mind my coming at all. If at all, they seemed to come closer, taking an avid interest in the stranger intruding into their domain. It was really a wildlife photographer (and much as I wanted to be, I don’t style myself one) dream come true. I probably shot a thousand pictures or more. But I also took my time enjoying the moment. Puffins were flying hither and thither, the males cleaning out last year’s burrows for the partners to the lay the eggs in, with the beautiful landscape all around me utterly overwhelming me. 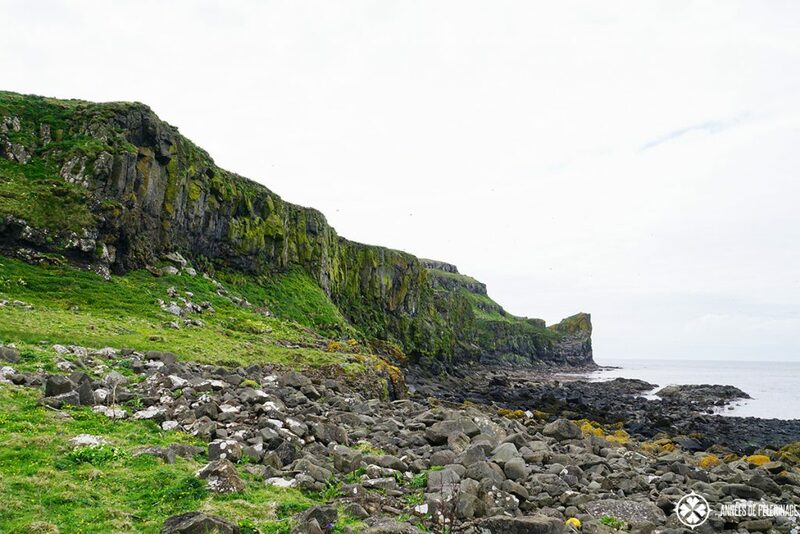 When I stayed in one spot, the Puffins came close, walking too hastily they shied away. Yet I decided to explore the island a bit more. The first cliff was no unique spot, though. 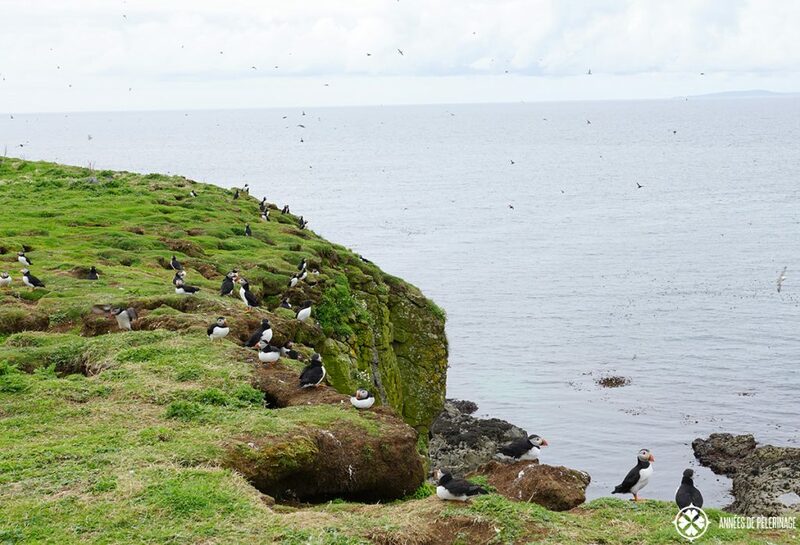 Walking down the length of the short island, Lunga presented me with yet more Puffins. By then I was ready to adopt one or two, maybe even the whole islands. These industrious guys are just beyond cute, don’t you think? But to be fair it was not just Puffins. A rather close relative is the Guillemot. With their blackheads and beaks, they were certainly not as charming as their cousins. But seeing them breeding in their thousands was no less impressive. Actually, at the far end of Lunga, there was one particular rock covered, so it seemed, with nothing but Guillemots and guano. You cannot imagine the noise they made. At the end of May, it was close to the breeding season and every one of them was busily flying about. Amongst the rocks, I also saw a couple of Razorbills. The population was not as strong as in other places among the Scottish Islands, but here you were able to come very close. Approaching the nests they made loud noises, almost sounding like an angry pig. We sure had our laughs but obviously respected their privacy. This is where I found myself a little rock to rest. Not that hiking around the island was particular exhausting (though the cliffs fall off quite steep, so nothing for the faint-hearted). But my brain was suffering from some sort of sensual overload. From my little outpost, I had a little lunch (brought some sandwiches) and enjoyed the scenery. It was such a sublime moment. Then and there I noticed the many beautiful flowers covering the islands. With that many birds flitting about, I was otherwise preoccupied, as you can imagine. 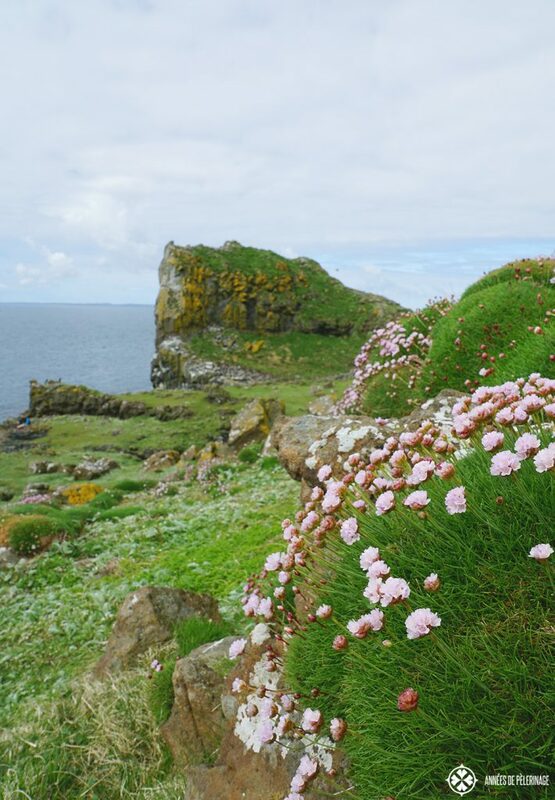 But the island of Lunga is, much as the other Treshnish Isles, home to quite a lot rare plants as well. Wild orchids, primroses, sea pinks, and yellow flags – it really felt like paradise. 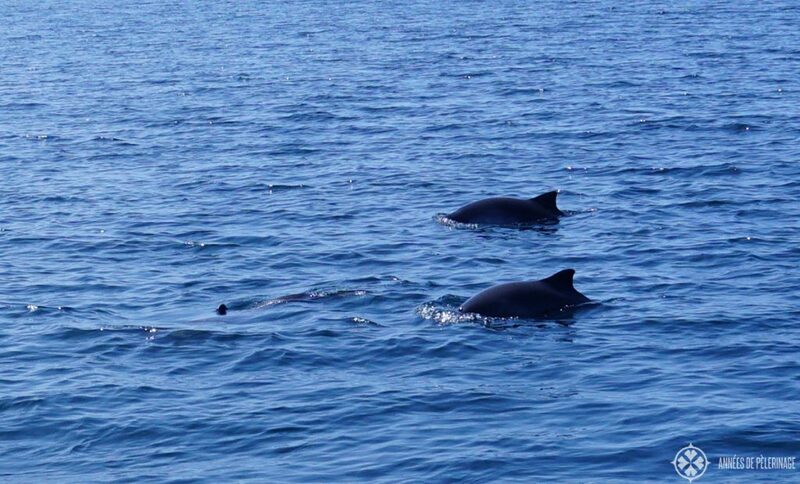 If you are super lucky, you will be able to see whales, dolphins, porpoise, basking sharks or White Tailed Eagles on your trip. I “only” saw porpoise, but then again I was more than lucky with the weather, so I shall not complain. As I made my way back to our ship, an elderly man (quite nimbly walking among the cliffs) offered to explain some details about the Puffin colony; obviously, I willingly accepted. 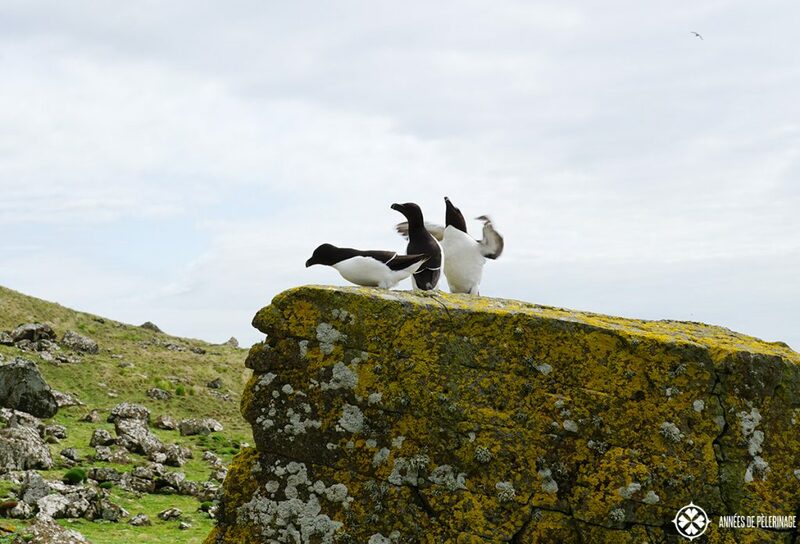 He told me that roughly 4,500 Puffins are now breeding on Lunga – one of the biggest colonies on earth (I could not verify these numbers, but there were certainly a LOT of Puffins). 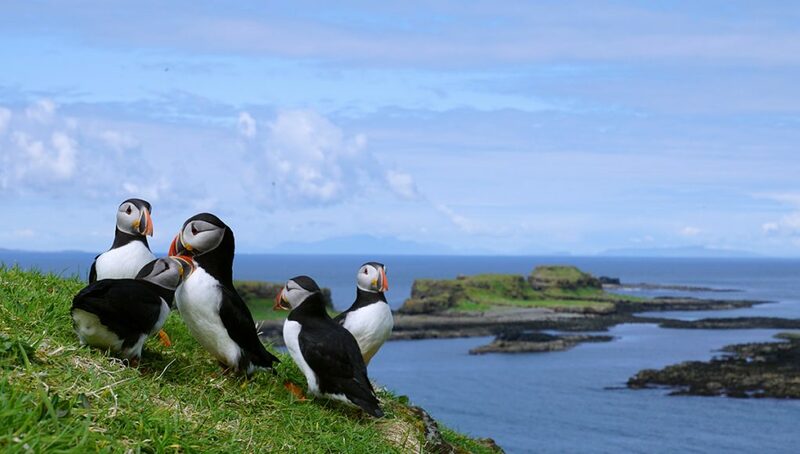 Even more amazing: Whereas the Puffin population is on the decline in other parts of the British Islands and Europe, Lunga actually sees an increase. This is one of the reasons Lunga is now a designated Site of Special Scientific Interest. Not yet a UNESCO World Heritage Site (unlike St. Kilda a few hundred kilometers farther east), though. But that might just be a matter of time. 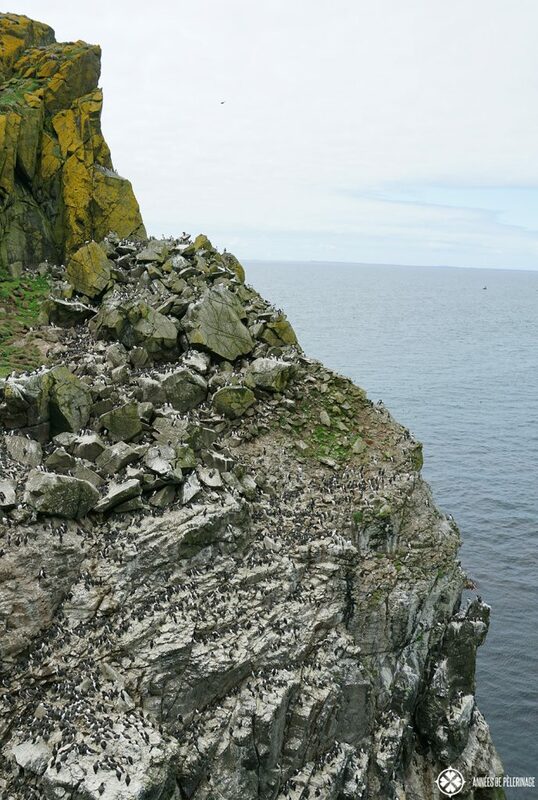 The exposed rock on the island I showed you earlier is called Dun Cruit and home to over 6,000 guillemots. I am actually quite amazed that more or less unregistered tourism is still possible on Lunga. That too might be a matter of time, for as of now the international crowds gather on Iceland for their Puffin experience. All in all, Lunga is quite small. The islands only covers 81 hectares – there is no way it would support any sort of mass tourism. Getting to Lunga is a bit more complicated. Some tours leave from Oban on the mainland, but these usually involve taking the Ferry to Craignure and then a coach ride to a port on Mull. From Mull, there are boats departing from Ulva Ferry, Ardnamurchan, Tobermory, and Fionnphort, as far as I know. I organized my trip via Staffatours (not affiliated with them; they did a great job, though!). If you are staying on the Outer Hebrides, there might be some tours as well, though I am not aware of them. You could always charter your own boat, though regular tours are not exactly crowded either. Starting out from Oban, as I did, takes a whole day. 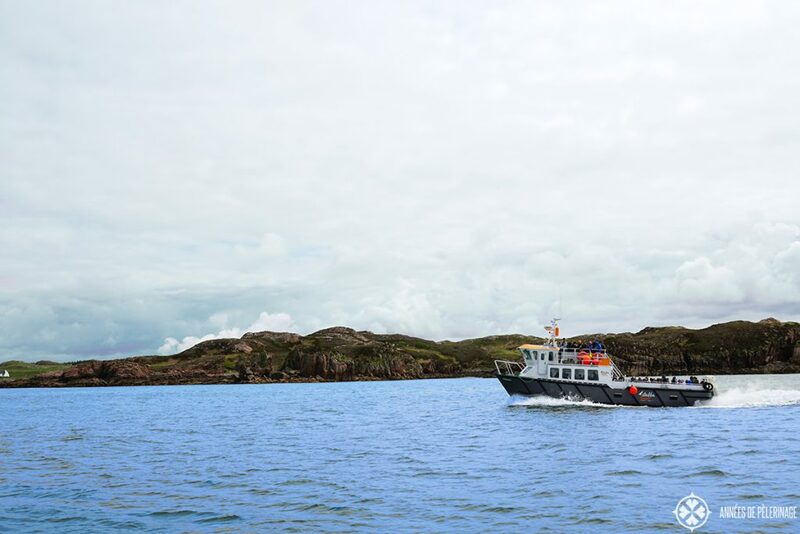 Depending on your tour, you will have plenty of time to see Staffa and Iona as well. Be prepared to wake up early and come home late, though. It’s probably better to book our tour not too much in advance. I was super lucky with the weather, but the Isles are not exactly known for their aridity. Rains and storms are common. 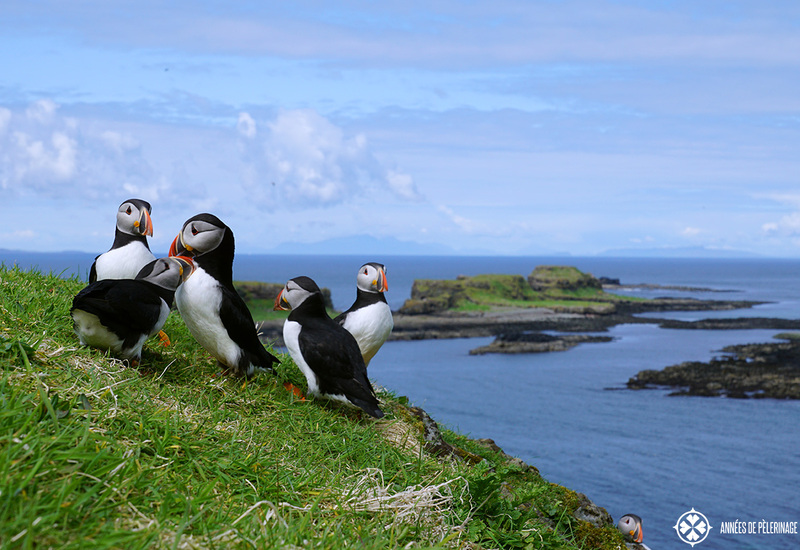 Also, be aware that be Puffins will be there only from Mid-May to July. Most of their life they spent out on the sea. Winter weather wouldn’t allow a visit in the rough seas anyhow. As I take my leave from the beautiful island, I pass by a stack of crumbled ruins. Once this island has been inhabited. There was never a strong population since the small island and its meager meadows wouldn’t support more. In 1857 Donald Campbell and his family left the islands, the last to have permanently lived there. 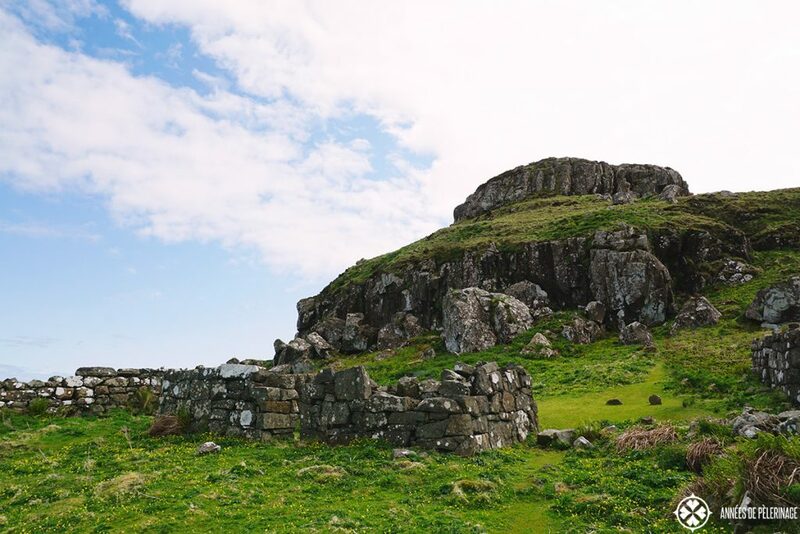 In medieval times, the Treshnish Isles had been a bit more popular. On the adjacent island of Cairn na Burgh Mòr, there was even a small castle. Norths sagas tell us of King Hakon of Norway assigning the property to Ewan MacDougall in 1249. While the castles passed on to different clans a couple of times throughout history, it was nevertheless occupied until the late 18th century. 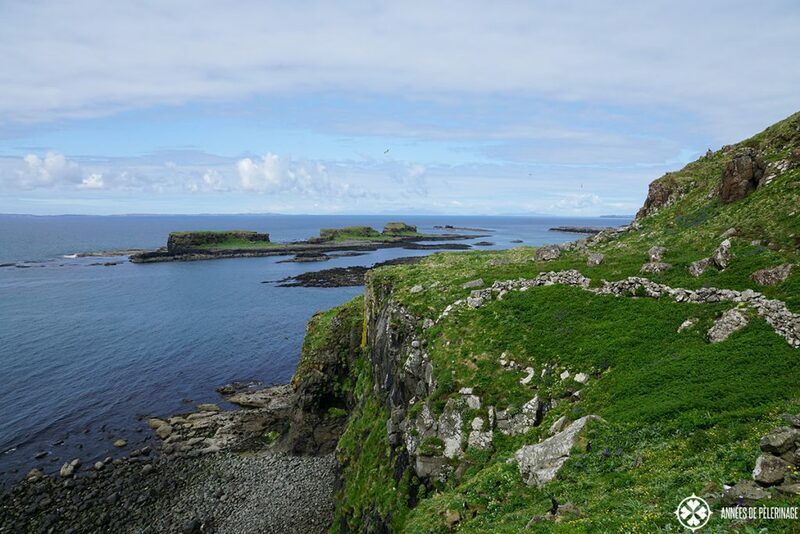 By then the MacLeans were in charge on the Treshnish Isles. These days the Hebridean Trust owns Lunga and the Treshnish Isles. The purchase was completed in April 2000. I pray with all my heart that they will be able to conserve this unique place for further generations. 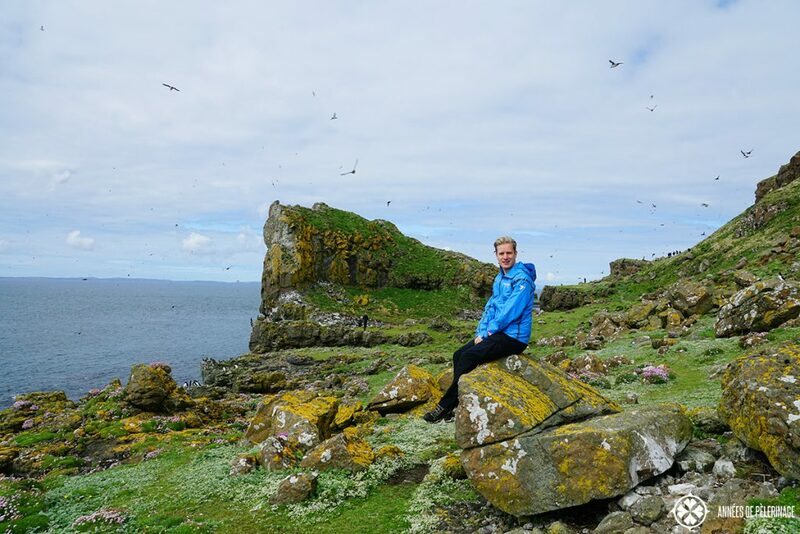 So, this was my little blog about visiting the Puffin colony on Lunga. Hope you enjoyed it. Got any question? Ask them in the comments below. And don’t forget to pin this to your pinterest board! haha! i agree. drizzle would be uncomfortable! ;-) but then again..if everything is wet, the green will shine just so beautifully! Put on the rain gear and enjoy it! To see Scotland without rain is not to see Scotland. Look to the sky. I have some fabulous pictures of Scottish skies and they are sure not all blue! Skye is called “The Misty Isle”. It is best that way. I’ll be back in whatever weather. Hi. What time of year did you go? I am thinking of going the beginning of October and was wondering if there would still be an abundance of wildlife? If you want to see the Puffins, October is a bad time. The chicks will already have hatched and the puffins flown away. 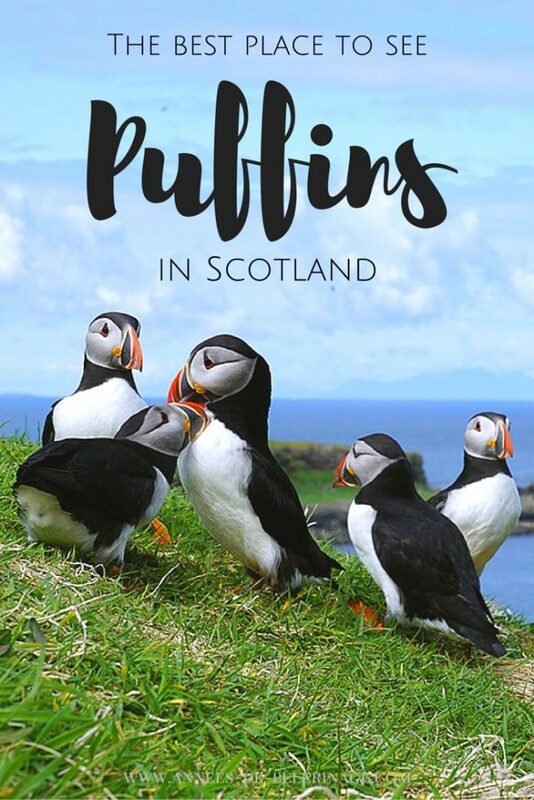 I went to Scotland last year, but haven’t seen any puffins. At the time I didn’t know, sadly, about this island! I saw some amazing bird colonies at Rubha Hunish, though. I hope to go back to Scotland one day, this time I will try to go and see this place, it looks absolutely magical! I wouldn’t say we have little in the way of wildlife experiences here! Aside from the puffins, we have red deer, roe deer, pine martin, beavers, eagles, buzzard, kites, ospreys, seals, otters, basking sharks, dolphins, red squirrel, lynx, scottish wildcat, adder, stoats, and of course the infamous scottish midge! And while you’re on your travels you’ll see highland cattle – not wild but beautiful! And as for the rain, people are waterproof!! Get out and live life and see these amazing animals! Awesome! I’m heading out here late July! 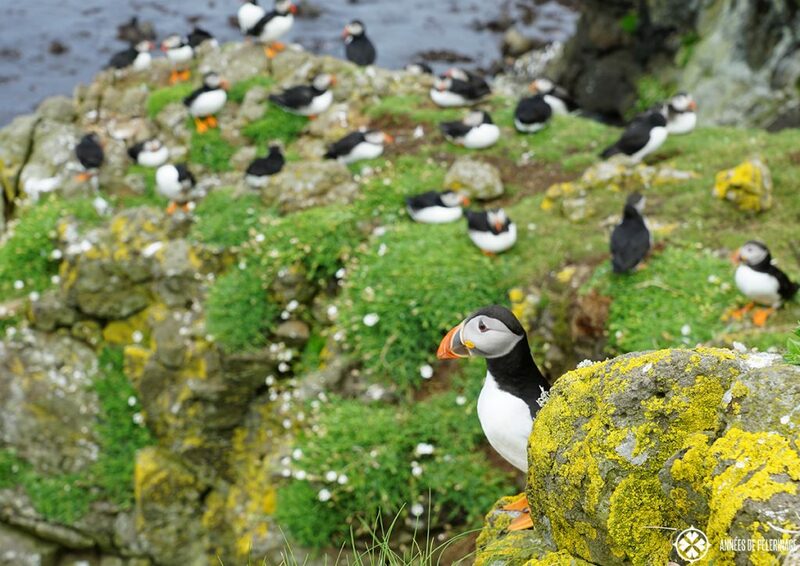 Hoping to see as many Puffins as you did!